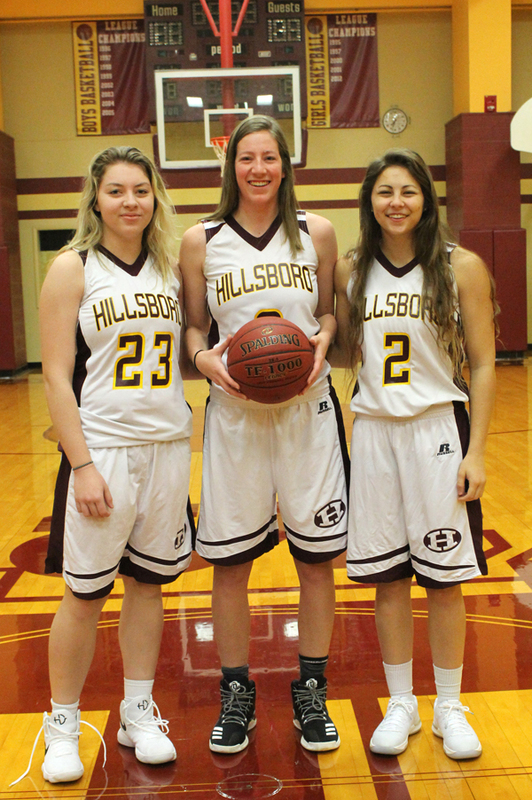 This trio of seniors and letter-winners will provide leadership on and off the court for the Hillsboro girls’ team as the Trojans prepare for the upcoming season. Returning only three players with significant varsity experience from a team that went 5-16 overall and 0-10 in league play, you might think Hillsboro girls’ basketball coach Nathan Hiebert will face another difficult season on the horizon. Not so, says Hiebert, who begins his 11th season as head coach. Instead, he’s looking to capitalize on the experience and leadership of three returning players while blending in an athletic freshman class. Seniors Abby Sechrist (5-feet-11) and Sienna Kaufman (5-8) return as starters who received honorable-mention a year ago by Central Kansas League coaches. Sechrist averaged 4.8 points and 5.4 rebounds per game last season, while Kaufman averaged 5.9 points and 4.2 rebounds. 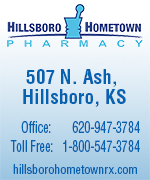 “Abby, statistically, really helped us in a lot of areas,” Hiebert said. “She’s one of our constants, defensively. She’s really long and moves fairly well for someone with her size. I confidently feel I could put her at guard or at post, just based on how she’s played. Kaufman was the Tro­jans’ primary ball-handler and defender last season. “She’s really good about attacking the basket,” Hie­bert said. “She’s really strong with the ball, and when she gets to the rim, she’s fairly strong. She is able to get some steals when we’re using the press. Trinity Malm (5-8), a junior, is the third varsity veteran returning. “Trinity brings a lot of toughness,” Hiebert said. “She really grew in her playing time last year. She started with a little bit, but by the end of the season we really needed her on the floor. Junior Eva Franz (5-6) found more court time as the season progressed. Junior Abby Driggers (5-8) and sophomore Addie Berens (5-9) also return, but with limited varsity time. Berens’ size and speed will be useful to the team. It remains to be seen, but the real game-changer for the Trojans may be Hie­bert’s freshman class. Hiebert said Teegan Werth (5-6) is a good ball handler and has the potential to be one of the Trojans’ better outside shooters. Dani Klein (5-5) is more of a slasher who attacks the basket, Hiebert said. “Defensively, she’ll just get on somebody,” he added. “We’ve had some girls in the past who were fun to watch go at it. She has that kind of mentality. At 5-11, Jessica Saunders moves well for a freshman at that size, and is well suited to play post or forward. “She has a good awareness of spacing and sealing,” Hiebert said. “She just needs a little more strength in the high school game, understanding the contact and the size. Tuesday Weisbeck, at 5-9, adds to her impact on the floor. “She’s better around the basket, but can play on the perimeter a little bit, too. But she’s better around the basket. She’s a lefty, and it’s sometimes nice to have something slightly different. The Trojans will open the season Dec. 1 at Sterling, followed by the Moundridge Pre-Season Tournament the following week. After going winless in the CKL last season, Hiebert and his players are preparing to make some noise this season. “Even last year, with not a great record, we could bother some teams,” he said. 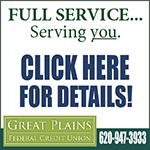 Kingman, Hesston and Nickerson will be challenging teams to defeat this season, Hiebert said. “Kingman brings back the Bangert twins (Bailey and Sydney),”he said. “Those two run their team so well; they’re highly skilled, strong and athletic. “Hesston is going to be challenging again. They lost a little bit (to graduation), but they keep reloading. Hiebert said his goal is to be prepared to compete right out of the gate. “I know it’s going to take some time, but I want to be ready by Sterling,” he said. “We still have almost two weeks of preparation. “We’re trying to get to the point where we’re doing a lot of stuff with confidence. Right now, we’re still trying to figure out how to do things.